There is "no current prospect" of a deal to restore power sharing in Northern Ireland, the Democratic Unionist Party (DUP) leader has said. Arlene Foster said the talks failed due to disagreements with Sinn Féin about legislation for the Irish language. 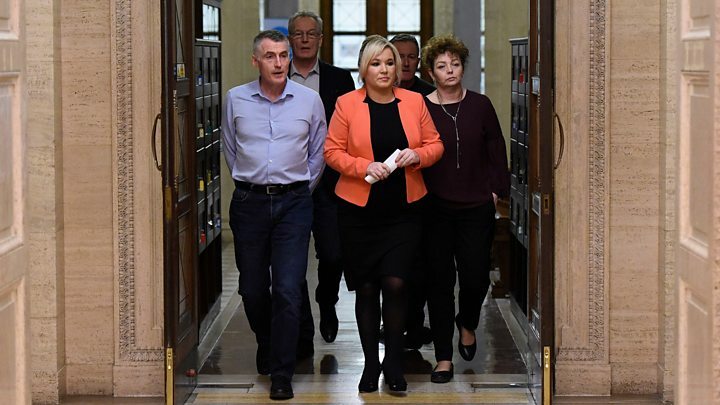 Sinn Féin's Michelle O'Neill accused the DUP of having "collapsed" the talks process. Both parties have been locked in negotiations in a bid to end the 13-month stalemate at Stormont. Mrs O'Neill, Sinn Féin's leader at Stormont, said her party had "reached an accommodation with the leadership of the DUP" but claimed that the DUP then "failed to close" on it. She added that Sinn Féin was in contact with both the UK and Irish governments and would set out its "considered position" on Thursday. In her statement, Mrs Foster called on the UK government to set a budget and start making policy decisions for Northern Ireland. The DUP leader said that "significant gaps" remained in the discussions between the region's two biggest parties. "We do not have a fair and balanced package," she added, saying that Sinn Féin's demand for legislation to give the Irish language official status in Northern Ireland was a key dividing issue. "I respect the Irish language and those who speak it but in a shared society this cannot be a one-way street," she added. "Respect for the unionist and British identity has not been reciprocated." The DUP would continue to aim for a restoration of devolution, she said, but it would "not accept a one-sided deal". After the DUP and Sinn Féin blamed each other for the failure of the talks, the Northern Ireland secretary signalled that a deal remained possible. "I believe the basis for an accommodation still exists," said Karen Bradley. "We will continue to work with everyone to make sure we deliver this." But Mrs Bradley added that the UK government would "need to consider practical steps" in the "continued absence" of devolution. She said "challenging decisions" would have to be taken and added that she intends to update MPs in Parliament next week. Taoiseach (Irish prime minister) Leo Varadkar tweeted that he regretted the DUP's statement and that "power sharing and working together are the only way forward". At Stormont on Wednesday, you could sense that things were not going well behind the scenes. There was a great sense of optimism last week. But it became pretty clear there was a standoff developing after Tuesday. Arlene Foster had appeared before the cameras and said that a stand-alone Irish language act was not something the DUP could accept. Sinn Féin came out and said there would be no deal unless it included one of those. We understand both parties met on Wednesday morning and quickly realised there was going to be no middle ground on an Irish language act. Then it was a matter of who was going to pull the plug first. Reporters were waiting in Stormont's Great Hall and we all thought we would hear from Sinn Féin first. Then the statement from Mrs Foster popped up on Twitter, making it very clear that this phase of negotiations was over. SDLP leader Colum Eastwood said he was "disappointed" and "angry" at the failure of the talks, and claimed it had left the Good Friday Agreement "in peril". He said the Stormont parties must resist a return to direct rule from Westminster, with "the DUP having the whip hand". Under an agreement struck last summer, the Conservative government relies on the DUP's support to stay in power at Westminster. Mr Eastwood said the parties must "not allow this moment to be the destruction of all that we have achieved". "We can't allow this British government, or this DUP to think that they're going to govern Northern Ireland on their own - that cannot be allowed to happen," the SDLP leader said. Robin Swann, the leader of the Ulster Unionist Party (UUP), described the talks process as a "shambles". He said: "What I think we need to know, and what Northern Ireland clearly needs to know, is the door to devolution now firmly closed?" Mr Swann called on the Northern Ireland secretary to provide clarity on whether it was the end of the talks or whether more negotiations were planned. The leader of Alliance Party, Naomi Long, said there was "no prospect of a deal and no process in place that could lead to a deal". "We are in a very precarious situation at this point in time, we are essentially in uncharted territory," she added. 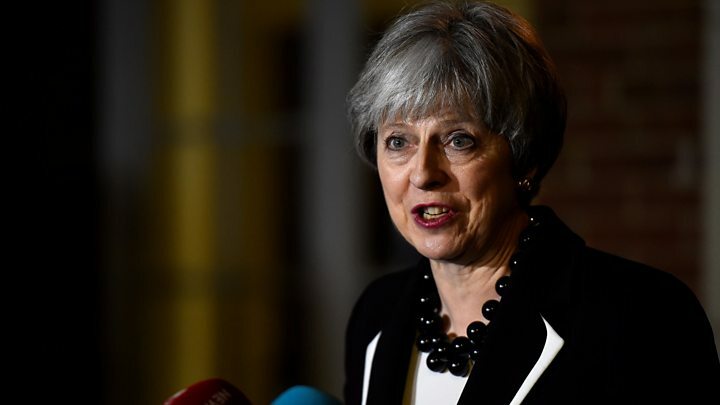 Hopes of an imminent deal had been "falsely raised" over the weekend, she said, and "now we have seen them dashed yet again". Speculation of a breakthrough mounted over the weekend, as both the UK and Irish leaders prepared to travel to Stormont to help seal a deal. But Prime Minister Theresa May and Mr Varadkar left Belfast on Monday with no sign of agreement. Former DUP minister Simon Hamilton described their visit as "a bit of a distraction". "I don't think it was entirely helpful in getting us to a successful conclusion," he told a press conference on Wednesday. The then deputy first minister Martin McGuinness pulled Sinn Féin out of the coalition after a bitter split between the governing parties. Londonderry Chamber of Commerce President, Jennifer McKeever said the lack of a deal was "disappointing and frustrating". "The collapse of the latest round of talks will come as another body blow for businesses in the North West which are facing the greatest economic challenge of our generation," she said. "Thirteen months is too long to be without devolved government and the lack of leadership from Stormont in the Brexit negotiations has been particularly frustrating for the business community," she added.